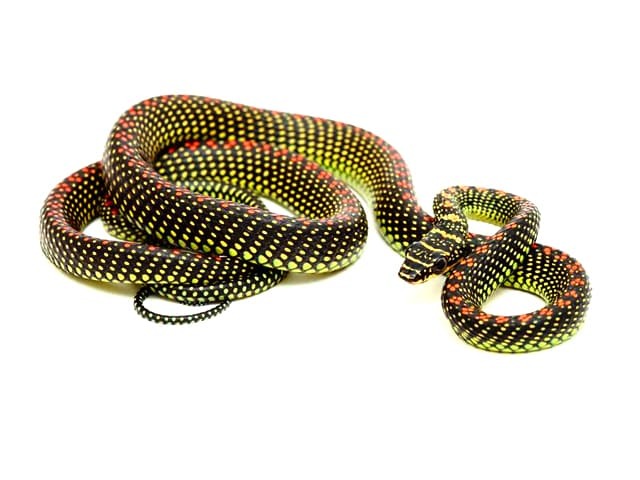 Chrysopelea paradisi is a brightly colored member of the Genus Chrysopelea (Flying Snakes). The snake is distinguished from other Asian snakes by its long, slender body. The black bodied Chrysopelea paradisi is covered from head to tail with a yellow spotting pattern that may form a somewhat striped pattern with red or orange splotches starting at the base of the head and extends down to the tail. These are arboreal snakes which do best housed in taller, vertical cages. Bare cages should be avoided. Optimal caging should be either planted or decorated with many thin branches and foliage providing the captives ample space to move around, climb, hide and hunt. My proposed cage dimensions are 0.6 x 0.6 x 0.6 meters (2 x 2 x 2 feet) but bigger is better and will provide more enjoyable viewing of natural habits such as hunting, basking, etc. Even though this species is arboreal, they will also utilize hide boxes. These can be on the cage floor as well as suspended above at height. Being that there should be a heat gradient, do not force you animals to choose one over the other…there should be hiding areas in both a warm and cooler area of the habitat. Personally, I prefer cypress mulch but just about any substrate will serve the purpose that can retain some moisture and not mold with frequent misting. These are tropical snakes so a warmer basking spot in the 30-31 ºC (87-89 ºF) should be provided and some cooler areas. Vertical cages are easy to create basking areas and temperature gradients. Ambient temperature should be 25-27 ºC (77-80 ºF) with cool side around 21-22 ºC (71-73 ºF) is optimal since that mimics the natural temps in the coolest time of the year at night for this species. There are many options for heat but lighting is not absolutely necessary. However, these are diurnal animals so there should be a light cycle of some sort whether natural or artificial just to provide periods of day/night. Always keep a water bowl in the cage but spraying 2-3 times per week is preferred. There are captive bred animals but at this stage in the game most are going to be field collected. As such, most paradisi are accustomed to drinking water droplets as rain and unfamiliar with an actual water bowl. Spraying will provide frequent hydration as you will often times see the snakes drinking as you are spraying them. While I generally do not concern myself with humidity, I do monitor shed cycles and will increase the humidity around this time to ensure proper shedding by spraying the animals directly or dampening the substrate. Be careful not to create humidity by closing up a cage and creating a damp and stuffy environment. Uncirculated air can cause respiratory problems in just about any snake species so leave the ample venting for air while also working on humidity. Paradisi are visually oriented, diurnal hunters. They can be trained to take dead prey once acclimated but at first you are probably going to have to offer live. This species feeds mainly on lizards in the wild but they are opportunistic and will feed on nestling birds, small rodents, frogs, etc. It has been my experience that long-term survival in captivity is usually accomplished by feeding a varied diet but leaning more to lizards. It is still uncertain if a full-time diet of rodents is detrimental to their health as I have had mixed results. I think a varied diet mimicking what would be most commonly found in the wild is best. I feed them 1-2 times per week depending on food item and size. This species is fast and agile with excellent eyesight. As such, they are high strung and flighty during handling. They are also rear-fanged which could cause adverse reactions if bitten. As a rule, any rear-fanged snake should only be kept by experienced hobbyists. The mechanism by which their bites are effective is by the act of chewing. A simple “nip” is probably going to be harmless but if an individual is allowed to chew and actually work any of their modified saliva into your body you could be in for some serious problems. Even though most are quite docile by nature, they are best left alone in my opinion. Arboreal animals are some of the easiest to maintain as the floor space is usually smaller than a terrestrial cage which makes spot cleaning a cinch. At some point you will need to replace all of the substrate but if you stay on top of things you can get many weeks out of each full breakdown. These animals will have nice, compete sheds if you have proper humidity. If you have a partial shed then you know you failed to increase humidity to the proper level at that time. Stress is the most common issue with this species being that they are usually field collected. Provide proper caging and leave them alone as much as possible and you will have better results. Dehydration is also a common concern with this species as they have a low body mass and will dehydrate quickly if not given proper husbandry. Another concern could be in the need to feed lizards which could potentially pass disease or parasites but I have not encountered any issues in that regard.